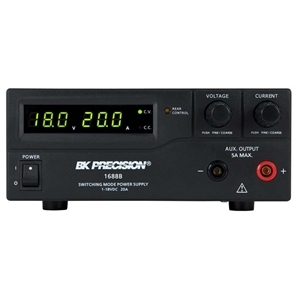 The B&K Precision 1688B switching mode DC power supplies provide various configurations of high output voltage or high output current in a small, lightweight form factor. In addition to its constant voltage (CV) and constant current (CC) modes, its high efficiency DC power supplies offer unique preset and remote control modes. Up to three different presets of voltage and current values can be saved for quick recall through a rear switch. For remote control, an analog remote control terminal is accessible on the rear, or use the USB interface to communicate with the power supply via PC software or remote commands. These features make the 1688B suitable for a wide range of applications including production testing, telecommunications, R&D, electronic field service and university labs.